Thomas was born and raised in the blue collar town of Garfield, NJ. Growing up with a younger brother, they played every sport in basements, backyards and ball fields in town. Once he got to high school, Thomas made the varsity team in soccer, basketball, as well as track and field. While receiving physical therapy following a right knee injury, Thomas found his interest in the human body, injury recovery, and the PT part of health care leading him to the field of physical therapy. In his senior year at Garfield High School, Thomas had an opportunity one semester to observe PTs in a professional setting at a physical therapy clinic one day per week. 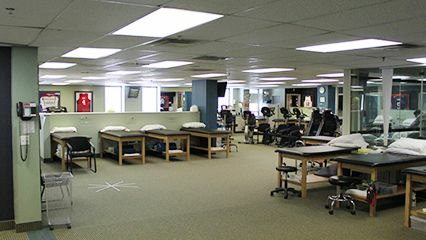 It was at this facility that made his decision that physical therapy was the career he was going pursue. Thomas then went to Seton Hall University and studied biology with a pre-graduate focus in physical therapy. It was in his senior year that Thomas started at University of Medicine and Dentistry, now part of Rutgers University. He is a proud member of the first class in New Jersey to graduate with a Doctorate of Physical Therapy. One year out of school, Thomas married his wife, Maggie, who holds a Psychology/Masters in Counseling degree, so together they have the understanding of the human body nearly covered. Three kids later, they enjoy being a part of travel soccer, choir and band performances, being with family and participating in their childhood church community now as a family. Kristyn graduated from The University of Scranton with an undergraduate degree in Exercise Science, and a minor in Nutrition. After completing her undergraduate degree, Kristyn went on to receive a Doctorate in Physical Therapy. While at the University of Scranton, Kristyn was fully involved in activities while participating in intramural sports, as well as other clubs and organizations. Growing up, Kristyn not only was active in team sports, such as volleyball and softball, but also took an interest in music and the performing arts. Kristyn had the opportunity to perform musically during a half-time show at a Jets football game at Giant Stadium, as well as at Avery Fisher Hall in NYC. Kristyn enjoys treating all ages and injuries; however, she takes a particular interest in treating post-operative shoulder and knee conditions. She enjoys the complexities that both these joints have to offer, as well as the in-depth nature of their rehabilitation. Jae earned his Doctorate of Physical Therapy from Dominican College of Blauvelt, NY and a Bachelor of Science in Biology at Ramapo College. While at Ramapo, he was involved with many organizations including Chapter President of Psi Sigma Phi Multicultural Fraternity, President of Ballroom Dancing Club, and a member of two National Honor Societies. Jae first developed an interest in Sports Medicine when he ran varsity track in High School. In his free time, he enjoys spending time with his family and friends, weight training, playing basketball, and watching the NBA.